We’ve compiled the below list of most common questions asked by our clients and colleagues regarding the World Trade Center Health Program (“WTCHP”) and the September 11th Victim Compensation Fund (“VCF”). Use the selection tool at the top to sort by category. If you believe you suffer from a 9/11-related illness, we encourage you to contact a 9/11 attorney as soon as you can to get answers specifically tailored to your individual situation. How much funding is available under the VCF? The Zadroga Act originally allocated $2.775 billion to the VCF to provide financial compensation to victims of the 9/11 attacks and their heirs. The “Reauthorized” Zadroga Act signed into law on December 18, 2015 allocated an additional $4.6 billion to the VCF for a total of $7.375 billion. These amounts include the governmental cost of operating the VCF (staff salaries, computer equipment, websites, phone systems, printing, etc.). There are currently no plans to increase the funding beyond this amount. What is the 9/11 Victim Compensation Fund (VCF)? The September 11th Victim Compensation Fund (“VCF”) provides financial compensation for pain and suffering, lost earnings and benefits, replacement services, and past out-of-pocket medical expenses caused by eligible physical conditions. Unlike the World Trade Center Health Program (“WTCHP”), the VCF does not cover psychological conditions. The VCF is administered by the Department of Justice (“DOJ”) with Sheila Birnbaum of Quinn Emanuel Urquhart & Sullivan LLP as the current Special Master. What is the World Trade Center Health Program (WTCHP)? The World Trade Center Health Program (“WTCHP”) provides free medical monitoring, treatment, and medication for physical and psychological illnesses to responders and survivors who satisfy certain eligibility criteria. Healthcare is offered through seven Clinical Centers of Excellence (“CCEs”) located throughout the NY/NJ metropolitan area. Those located outside the NY/NJ metropolitan area have access to the National Provider Network (“NPN”) administered by Logistics Health Inc. (“LHI”) that provides free healthcare at a vast network of clinics nationwide. The WTCHP is administered by the National Institute for Occupational Safety and Health (“NIOSH”) as part of the Centers for Disease Control and Prevention (“CDC”), a federal agency. What is the Reauthorized Zadroga Act? The Zadroga Act was due to expire in October of 2016 but was extended thanks to the efforts of union coalitions, activists, and years of relentless advocacy championed by Kirsten Gillibrand, Carolyn Maloney, Jerrold Nadler, Peter King, and Chuck Schumer. The extension, entitled the James Zadroga 9/11 Health and Compensation Reauthorization Act, was included in the 2015 Omnibus spending bill signed into law by President Obama on December 18, 2015. The Reauthorized Zadroga Act significantly increased funding for the World Trade Center Health Program (“WTCHP”) and Victim Compensation Fund (“VCF”), allowing the WTCHP to operate until late 2090 and the VCF to remain open until December 2020. What is the Zadroga Act? On January 2, 2011, President Obama signed the James Zadroga 9/11 Health and Compensation Act of 2010. The Zadroga Act (named for James Zadroga, an NYPD Detective who died in 2006 from respiratory failure linked to Ground Zero exposure) established and provided funding for two separate but related federal benefit programs: The World Trade Center Health Program (“WTCHP”) and the September 11th Victim Compensation Fund (“VCF”). The WTCHP provides free medical monitoring, treatment, and medication for physical and psychological conditions while the VCF provides financial compensation for the pain, suffering, lost earnings, replacement services, and medical expenses caused by 9/11-related physical conditions. How are VCF awards distributed? September 11th Victim Compensation Fund awards are being distributed on a first-come, first-serve basis as a tax-free lump sum payment. What will happen if the VCF runs out of funding? It is unknown at this time. Because awards are distributed on a first-come, first-serve basis, we encourage all prospective claimants to register and file their claims as soon as possible. Any decision to extend the September 11th Victim Compensation Fund and/or increase its funding will come down to political decisions by made elected officials. We encourage all Americans to call and write their Congressional representatives to remind them that 9/11 remains an important issue affecting thousands who suffer from 9/11-related illnesses. How long will World Trade Center Health Program benefits be available? The “Reauthorized” Zadroga Act allocated an additional $3.5 billion for the WTCHP to provide free medical monitoring, treatment, and medication benefits until late 2090. In effect, this guarantees lifetime coverage for almost everyone suffering from 9/11-related illnesses or those who will be diagnosed in the future. Do I need to hire an attorney to obtain World Trade Center Health Program benefits? No. The World Trade Center Health Program (“WTCHP”) has an online application process or you can call 888-WTC-HP4U to request a hardcopy application. Pitta & Baione LLP assists all of our VCF clients with the WTCHP enrollment process. Do I need to hire an attorney to obtain a 9/11 Victim Compensation Fund award? No. As with other benefits programs such as workers’ compensation, and as with personal injury lawsuits, you are not required to be represented by an attorney. You are free to represent yourself. However 83% of all VCF claimants are represented by attorneys Source: VCF Fourth Annual Status Report, February 2016 . Pitta & Baione LLP attorneys have years of experience representing VCF claimants and decades of litigation experience. Contact us if you are considering hiring our firm to handle your VCF claim from start to finish. Are psychological conditions such as PTSD covered under the Zadroga Act? The Zadroga Act provides for the free diagnosis and treatment of psychological conditions such as PTSD and depression through the World Trade Center Health Program but does not provide for financial compensation through the September 11th Victim Compensation Fund. Are there any World Trade Center Health Program deadlines? Generally, there are no deadlines concerning the World Trade Center Health Program other than its 2090 expiration date. However, there are important deadlines relating to the September 11th Victim Compensation Fund. When are the 9/11 Victim Compensation Fund deadlines? There are two important deadlines The applicable deadline is the date by which the required forms must be submitted/uploaded to your online claim or postmarked (if sending by mail). If the date falls on a Sunday or a Federal Government holiday, the forms must be submitted/uploaded or postmarked by the next business day. for each claim. The first deadline is the date by which you must register your claim with the Victim Compensation Fund. This date is different for each claimant and depends on individual circumstances, most importantly the Registration Start Date. The Registration Start Date is defined as the date on which the claimant knew or reasonably should have known: (1) that the victim suffered physical harm as a result of the terrorist-related aircraft crashes of September 11, 2001, or debris removal in the immediate aftermath, and (2) that the claimant was eligible to file a claim with the VCF. Prior to the newly announced deadlines, the VCF declared the start date of the two-year deadline to register for 9/11 victim compensation as the date on which an illness or condition was first diagnosed. The below chart lists the deadlines that correspond to the claimant’s individual Registration Start Date. The second deadline is the date by which you must fully file your completed forms and all required supporting documents. This date is the same for all claimants: December 18, 2020. What is the difference between the World Trade Center Health Program and the September 11th Victim Compensation Fund? The World Trade Center Health Program provides free medical monitoring, treatment, and medication for physical and psychological conditions while the September 11th Victim Compensation Fund provides financial compensation for physical conditions. Each program is operated by different government agencies and has different eligibility criteria. Am I eligible for 9/11 benefits? In general, anyone who was present in Lower Manhattan below Canal Street, the Fresh Kills landfill, barges/trucks that moved debris, the NYC Morgue, or garages where emergency vehicles were cleaned; or responded to the Pentagon or Shanksville, PA crash sites between the dates of September 11, 2001 and May 30, 2002; and contracted a covered illness may be eligible for free healthcare and/or financial compensation. It depends on whether all eligibility criteria is satisfied and all applicable deadlines are met. Contact us to learn more. What is the relationship between the World Trade Center Health Program and the September 11th Victim Compensation Fund? Although they are two separate benefit programs with different eligibility criteria and application processes You must apply separately to either program. Registering for one does not mean you are registered for the other. , the World Trade Center Health Program (“WTCHP”) and the September 11th Victim Compensation Fund (“VCF”) are related in the following manner. Physicians at the WTCHP determine if your conditions are likely to have been caused by 9/11. If your conditions are deemed to be caused by 9/11, the WTCHP will issue you a certification letter This is sent from WTCHP Administrator Dr. Howard and includes a table indicating the certification date, condition category, and certification category. listing all certified conditions. This letter may include certifications for both physical and psychological conditions, but only physical conditions Psychological conditions such as PTSD, depression, and anxiety are NOT eligible for financial compensation under the VCF. are eligible for financial compensation under the VCF. Certification letters issued by the WTCHP for 9/11-related physical conditions will be accepted by the VCF as proof of your eligible condition. Must I be enrolled in the World Trade Center Health Program to be eligible for the September 11th Victim Compensation Fund? The claim is being submitted for a deceased victim who was not treated by the WTCHP for the claimed condition prior to passing away. The claimant was previously deemed eligible for compensation from the VCF based on a certified condition and is now seeking to add a non-certified cancer as a newly claimed condition. The claimant is unable to go to a WTCHP treatment location (either in the New York City Metropolitan Area or through the Nationwide Provider Network) to have their condition evaluated and certified for treatment without suffering significant hardship. The Special Master, in her discretion, deems enrollment in the WTCHP unnecessary on a case by case basis. If any of the above exceptions apply, the claim can be filed using medical records alone through what is known as the Private Physician Process. This requires the submission of specific medical records directly to the VCF to prove your conditions are related to 9/11. This process is time consuming and requires submission of additional forms, information, and the precise medical records required by the VCF. More information on the Private Physician Process can be found here. Which conditions are covered under the Zadroga Act? The complete list of the 70 plus cancers and other covered conditions can be found at the Centers for Disease Control’s website. Conditions not on this list may be covered if they resulted from the treatment or progression of an underlying certified WTC-health condition. For example, certain permanent conditions caused by cancer treatment such as chemotherapy and radiation may be certified. Why are psychological conditions covered by the World Trade Center Health Program but not the September 11th Victim Compensation Fund? The Zadroga Act, the statute that created the September 11th Victim Compensation Fund (“VCF”), limits eligible injuries to those consisting of “physical harm.” While individuals with psychological injuries such as PTSD, depression, or anxiety may be eligible for free treatment and medication provided by the World Trade Center Health Program (“WTCHP”), the statutory language Source: James Zadroga 9/11 Health and Compensation Act of 2010 does not allow the VCF to provide compensation related to individuals’ psychological illnesses. How long does it take to receive an award from the September 11th Victim Compensation Fund? It can take anywhere from nine months to 1-2 years for the September 11th Victim Compensation Fund (“VCF”) to fully process a claim for compensation. The date submitted and the specific circumstances of each claim affect the processing time. Generally, claims are processed in a “first in, first out” order based on the date the claim was fully submitted. For those suffering from a terminal illness or financial ruin such as impending foreclosure or bankruptcy, there is a mechanism to request expedited claim review for such “exigent circumstances.” These exigent circumstances requests are approved sparingly and must be supported with ample proof of hardship. What is the NYC Exposure Area? For eligibility purposes, applicants to the World Trade Center Health Program (“WTCHP”) and claimants with the September 11th Victim Compensation Fund (“VCF”) must have been physically present at a 9/11 crash site Ground Zero, The Pentagon, or Shanksville, PA or within the NYC Exposure Area. The exposure area differs for the WTCHP and the VCF. The WTCHP employs a broader definition that encompasses the area of Manhattan south of Houston Street and any block in Brooklyn that is wholly or partially contained within a 1.5-mile radius of the former World Trade Center site. 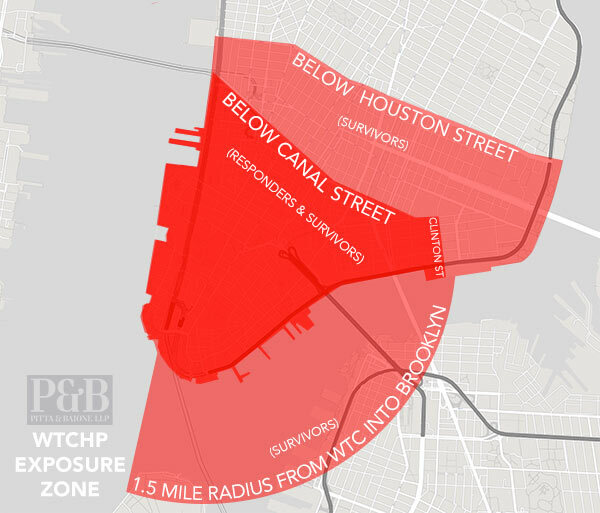 As you can see in the map below, the WTCHP differentiates between responders and survivors who have different eligibility criteria Responders must have been present below Canal Street while survivors must have been present below Houston Street or within the 1.5 mile radius into Brooklyn. In general, responders require a lower number of hours of exposure than survivors to be eligible for the WTCHP. and access to medical treatment Responders are entitled to an annual checkup even if they have no medical issues whereas survivors must have symptoms of at least one covered condition. Responders also have access to a broader range of treatment locations within the Metropolitan New York City Area. . 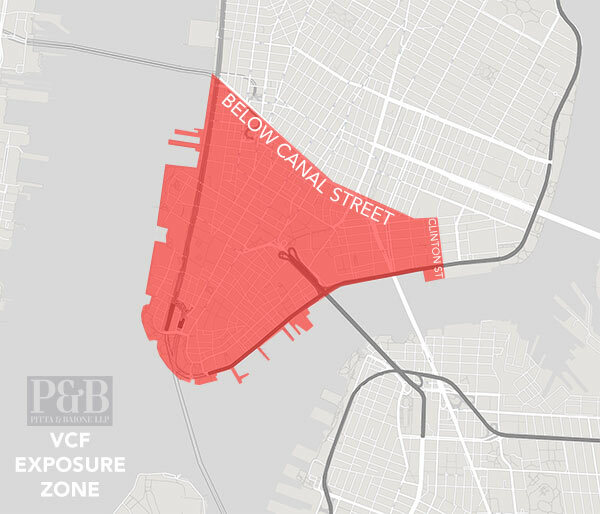 The VCF employs a smaller NYC Exposure Area defined as the area in Manhattan south of the line that runs along Canal Street from the Hudson River to the intersection of Canal Street and East Broadway, north on East Broadway to Clinton Street, and east on Clinton Street to the East River. Both the WTCHP and VCF may consider the eligibility of individuals who worked at Fresh Kills Landfill in Staten Island, the New York City Chief Medical Examiner’s Office, or other areas related to, or along, routes of debris removal, such as barges used in the cleanup and garages where 9/11 dust covered vehicles were stored or cleaned. Where is the World Trade Center Health Program? The World Trade Center Health Program (“WTCHP”) provides monitoring and treatment at seven Clinical Centers of Excellence (“CCEs”) throughout the NY/NJ metropolitan area (some having multiple locations) as well as the National Provider Network (“NPN”) of clinics located throughout the United States. If you live in an urban area, the NPN will try to find you care within 30 miles or less of your residence. If you live in a rural area, the NPN will try to find you care within 70 miles or less of your residence Enrollees can select a location of their choice that corresponds with their respective category, but only one transfer per year is allowed (except under special circumstances). What is the National Provider Network (NPN)? The World Trade Center Health Program National Provider Network (NPN) provides care for 9/11 responders and survivors who live outside of the New York Metropolitan Area. The NPN was designed to allow convenient care near victims’ workplaces or residences. It also permits continuity of care in the event of a change in residence. If you live in an urban area, the NPN will try to find you care within 30 miles or less of your residence. If you live in a rural area, the NPN will try to find you care within 70 miles or less of your residence. For more information, including information on the location of local providers available to you through the NPN, contact the NPN tollfree at 877-498-2911. The NPN handbook can be found here. What are the most common 9/11-related cancers? What does the World Trade Center Health Program cost? Use pharmacies that participate in the WTCHP to fill any prescriptions you are given for a 9/11-related health condition by an approved WTCHP healthcare provider. Am I already enrolled in the World Trade Center Health Program? If you are unsure if you are enrolled, call the World Trade Center Health Program (“WTCHP”) at 888-982-4748 to determine if you are already a member. It is possible you were automatically enrolled into the WTCHP due to your prior membership in one of two earlier programs known as the WTC Medical Monitoring and Treatment Program (“MMTP”) and the WTC Environmental Health Center Community Program (“WTC EHC”). The MMTP was for responders and volunteers while the WTC EHC was for survivors, area residents and residents. These programs were both replaced by and merged into the WTCHP in July 2011 and most members were automatically rolled over into the WTCHP. What healthcare benefits does the World Trade Center Health Program provide? The WTCHP provides medical monitoring and treatment for emergency Responders, recovery, and cleanup workers, and volunteers who helped after the terrorist attacks on September 11, 2001, at the World Trade Center, the Pentagon, and the Shanksville, Pennsylvania crash site. The WTCHP also provides health evaluations and treatment for Survivors, i.e. those who were present in the dust cloud on 9/11 or who worked, resided, or attended school, childcare, or adult daycare in the New York City disaster area for a period of time on 9/11 and/or during the following months. Research to better understand health conditions related to the attacks. The level of care provided by the World Trade Center Health Program (“WTCHP”) depends on whether you are classified as a Responder (you worked or volunteered in the response, recovery, or cleanup) or Survivor (you survived attacks on 9/11, worked, resided in, visited, or attended school or daycare in the Exposure Area). Responders who enroll in the WTCHP receive annual medical monitoring regardless of whether or not they are currently diagnosed with any 9/11-related conditions. If you have any health conditions certified as a 9/11-related as defined by the Zadroga Act (i.e., an illness or health condition for which exposure to airborne toxins, other hazards, or other adverse conditions resulting from the September 11, 2001, terrorist attacks was substantially likely to be a significant factor in aggravating, contributing to, or causing the illness or health condition) , the WTCHP healthcare providers will provide medical treatment and medication for the 9/11-related health condition. Survivors who enroll in the WTCHP will receive an initial health evaluation to determine if you have a health condition eligible for coverage. If you have a health condition that is considered 9/11-related, your physician will request that the WTCHP certify your condition as eligible for treatment. If the WTCHP agrees with your physician and determines you have a health condition that is certified as a 9/11-related health condition as defined by the Zadroga Act (i.e., an illness or health condition for which exposure to airborne toxins, other hazards, or other adverse conditions resulting from the September 11, 2001, terrorist attacks was substantially likely to be a significant factor in aggravating, contributing to, or causing the illness or health condition) , then the WTCHP healthcare providers will provide medical treatment and medication for the 9/11-related health condition. Is there a research element to the World Trade Center Health Program? In addition to providing healthcare for eligible individuals with 9/11-related health conditions, the WTCHP collects voluntarily provided health data from WTCHP members to be used in studying and understanding the health effects of 9/11 toxins. How do I update the World Trade Center Health Program about my newly diagnosed condition? Call your World Trade Center Health Program (“WTCHP”) treatment center to schedule an appointment. If you were treated for this new condition by private physicians, it may help to bring diagnostic medical records along with you to the appointment. If you don’t know which treatment center you are assigned to or lost the number, call the WTCHP main line at 888-982-4748 and they should be able to help. Does the World Trade Center Health Program provide dental health benefits? Yes, but only if the specific dental care is medically necessary This means the treatment has been shown to manage, cure, or improve a WTC-related health condition or a sickness that was caused by a 9/11-related condition (known as a medically associated condition) to treat a certified condition such as 9/11-related head and neck cancers. Will the World Trade Center Health Program cover treatment of conditions associated to my certified 9/11-related conditions? Yes, but only if the specific treatment is medically necessary This means the treatment has been shown to manage, cure, or improve a 9/11-related health condition or a sickness that was caused by a 9/11-related condition (known as a medically associated condition) to treat a certified condition. For example, someone suffering from certified severe chronic bronchitis that is causing hernias may have that condition certified as an associated condition. I live far from New York City. Do I have to travel there for treatment by the World Trade Center Health Program? No. You will have access to the World Trade Center Health Program National Provider Network (NPN). This national network provides care for responders and survivors who live outside of the New York Metropolitan Area. The NPN was designed to allow convenient care near victims’ workplaces or residences. It also permits continuity of care in the event of a change in residence. If you live in an urban area, the NPN will try to find you care within 30 miles or less of your residence. If you live in a rural area, the NPN will try to find you care within 70 miles or less of your residence. However, you are not required to go to an NPN location and may still opt to treat at a location within the New York Metropolitan Area if you prefer. For more information, including information on the location of local providers available to you through the NPN, contact the NPN tollfree at 877-498-2911. The NPN handbook can be found here. Are over-the-counter medications covered by the World Trade Center Health Program? Yes. If your World Trade Center Health Program (“WTCHP”) doctor prescribes you an over-the-counter (“OTC”) medication, it will be filled by the pharmacist the same as any other prescription and the WTCHP will pay all costs. The WTCHP will not reimburse you for any OTC medications you purchase on your own. This means commonly prescribed OTC nasal sprays (Flonase, Nasacort, etc.) and proton pump inhibitors (Prilosec, Nexium, etc.) may be fully covered by the WTCHP. How do I make an appointment with the World Trade Center Health Program? If not already enrolled, you must first apply before making an appointment. The World Trade Center Health Program (“WTCHP”) has an online application process or you can call 888-WTC-4748 to request a hardcopy application. Pitta & Baione LLP assists all of our VCF clients with the WTCHP enrollment process. If you are already enrolled, you must call your treatment location. If you do not know your treatment location, call the WTCHP at 888-WTC-4748 and they should be able to help. Can I change my World Trade Center Health Program treatment location? Yes. If you would like to switch, you may select another participating clinic location to provide your benefits. If you move out of the New York City Metropolitan Area, you may transfer into the Nationwide Provider Network (“NPN”). Prior to making the change, you must first notify your current clinic location or the NPN and have your medical records transferred to the new location to arrange an appointment. Only one transfer per year is allowed, except in special situations. Is the World Trade Center Health Program a substitute for my current insurance? No. The World Trade Center Health Program (“WTCHP”) provides medical monitoring and treatment only for conditions specified on the official list of covered 9/11-related health conditions. If your healthcare physician in the WTCHP determines you have a health condition not on the list, he or she will advise you about seeking care outside the program. Does the World Trade Center Health Program cover psychological conditions? Yes. The World Trade Center Health Program (“WTCHP”) covers mental health conditions related to 9/11 such as PTSD (Post Traumatic Stress Disorder), depression, and anxiety. This means that the government will cover the cost of medical care and treatment for 9/11-related psychological conditions. However, since the other half of the Zadroga Act, the September 11th Victim Compensation Fund (“VCF”) does not cover psychological conditions, the government will not provide financial compensation for the pain, suffering, or economic losses associated with any 9/11-related psychological conditions. Does the September 11th Victim Compensation Fund cover psychological conditions? No. The September 11th Victim Compensation Fund (“VCF”) does not cover mental health conditions related to 9/11 such as PTSD (Post Traumatic Stress Disorder), depression, and anxiety. This means that the government will not provide financial compensation for any pain, suffering, or economic losses associated with any psychological conditions. Can I file a 9/11 VCF claim if I participate in the Justice Against Sponsors of Terrorism Act (JASTA) lawsuit against Saudi Arabia? Yes. However, any compensation awarded by the court in the Justice Against Sponsors of Terrorism Act (“JASTA”) lawsuit or obtained in a settlement of litigation will be considered an offset and deducted from your September 11th Victim Compensation Fund (“VCF”) award. This means that your potential JASTA award must be greater than your VCF award for you to realize a monetary benefit from participating in the JASTA lawsuit. How much money can I receive from the September 11th Victim Compensation Fund? Economic loss is the past and future loss of earnings and the value of benefits related to employment caused by a 9/11-related physical condition. This requires proof of a temporary or permanent disability caused by a certified 9/11-related physical condition(s) as determined by a workers’ compensation board, the Social Security Administration, local/state entities (such as NYPD, NYCERS, FDNY), private insurers, private physicians, or the World Trade Center Health Program Disability Evaluation Process. Depending on an individual’s circumstances such as starting salary and their age at disability, economic loss awards range in the hundreds of thousands to millions of dollars. Non-economic loss is awarded to compensate for the pain, suffering, and decrease in quality of life caused by 9/11-related physical conditions. The Special Master determines non-economic losses on a case-by-case basis. Generally, the more severe the injuries the higher the non-economic loss portion of the award. After calculating the economic plus non-economic losses, the VCF will then subtract any collateral offsets received or eligible to be received. Collateral sources are defined to include all such sources, including life insurance, pension funds, death benefit programs, settlement payments from September 11th-related lawsuits, and payments by Federal, State, or local governments related to the terrorist-related aircraft crashes of September 11, 2001 or debris removal. What effect will a VCF award have on my existing disability payments? VCF awards have no effect on Federal or State Workers’ Compensation, Social Security Disability, or any other similar program. However, a VCF award may be reduced by the amount of any payment made by Federal, State, or local governments related to the 9/11 attacks. Therefore, the value of all past payments and the present value of all future payments made as a result of the same 9/11-related physical conditions deemed eligible by the VCF will be deducted from the total award as calculated by the VCF. Filing a VCF claim never affects ongoing recovery or entitlement of existing payments and in the event a VCF claim is less than the total calculated value of collateral offsets, there will simply be no VCF award Because VCF attorney fees are contingent upon a recovery, the claimant is not financially harmed in this scenario. .
A representative will respond within 24 hours.